A suspect in a white pickup fled police at speeds over 90 mph in the Long Beach area Friday Dec. 1, 2017. 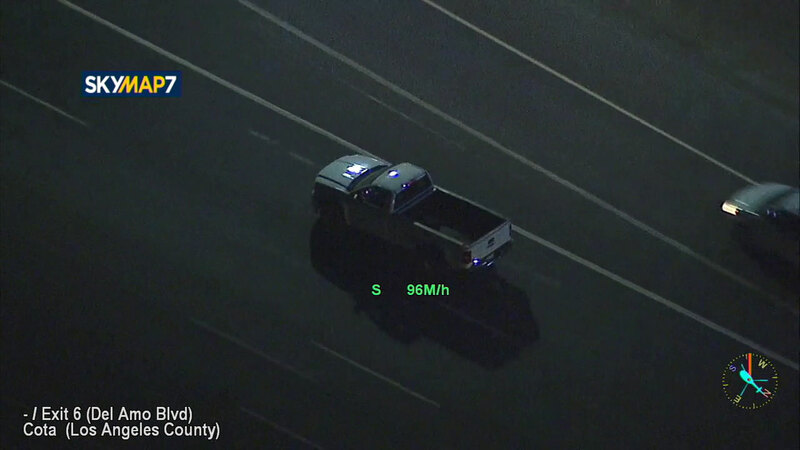 LONG BEACH (KFSN) -- CHP officers pursued a suspect in a white GMC pickup truck at high speeds through the Lakewood-Long Beach area Friday night. After the suspect fled at speeds over 60 mph on surface streets with the headlights off and passed through red lights, the ground units backed off from the pursuit. A law enforcement helicopter remained overhead tracking the suspect as the car continued to flee. The truck eventually headed onto the southbound 710 Freeway at speeds in the 90-100 mph range. Police cruisers rejoined the chase after the suspect entered the freeway. They later pulled off the pursuit again as the suspect exited the freeway onto Carson surface streets. It was not immediately known why the suspect was initially wanted.